The short demonstration video says it all really. 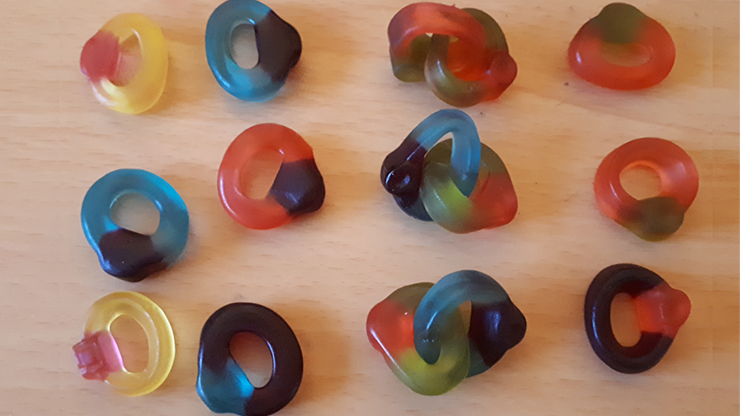 Quite simply, the audience sees you take two Gummy Sweet Finger Rings, tap them together and they visually and visibly link together in front of their eyes in the most amazing manner. And, YES, they can be examined once linked. Within the short PDF and approx. 10-minute teaching video download, you will be taught how to approach a table empty handed and, indeed, be able to show your hands cleanly empty before you take a small sealed bag of mixed gummy sweets and open them in front of your audience. They will then see you remove two single finger rings from the bag that has just been opened before you tap them together and make them visibly link together! At that point they can, if desired, be examined and confirmed that they are genuinely linked together. In these mixed bags of gummy sweets, you also get cola bottles and, with these, you could incorporate a "two-in-the-hand and one-in-the-pocket" style routine. This could end with the production of a giant gummy cola bottle -- something mentioned within this package to get you thinking. A little practice will be needed (and care) to master making the gimmicks used in this routine, but once you have got the hang of it, the actual performance of this visual miracle that audiences (especially children) love is relatively easy to master.